What’s the impact of being one of the 100 best companies to work for? What does it take to join this elite group? How does your organization or team compare? Since 1998, Fortune magazine has partnered with Great Place to Work to create its annual list of 100 best companies to work for. 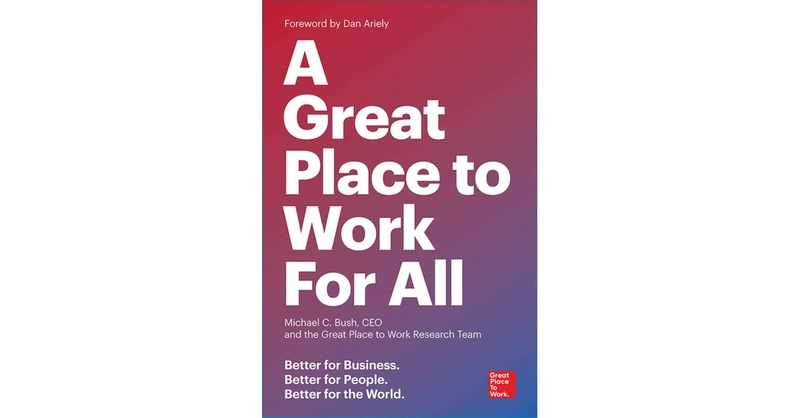 This year’s list has just been published along with a new book by Great Place to Work CEO, Michael Bush and his research team. A Great Place to Work for All provides a much deeper look at the research findings. 71 percent of Americans are part of a “spend shift” to align their spending with their values. 81,000 undergraduates ranked an inspiring purpose as the most desired characteristic in an employer. A great workplace is 20 times more likely to retain Millennials. Agility is becoming critical and leaders need to involve more people throughout the organization in change efforts. High-trust and highly functioning executive teams are critical for elevating and cascading culture change and development. When employees rated executives highly on strategic clarity, even-handedness, and authenticity in their relationships revenues grew 3 times faster than companies with the lowest scores. When Millennials report that their managers show a sincere interest in them as people they’re 8 times more likely to respond with change readiness, agility, and innovation. The 100 Best Companies to Work For have increased training by 76 percent in the past 20 years to 58 hours per year for hourly employees and 65 hours for salaried. A Great Place to Work for All reinforces and updates similar global studies of leadership and culture effectiveness. The mountain of evidence keeps growing; strong cultures create strong workplaces. That leads to outstanding personal, team, and organizational results for all. Material is credible and vital to being a leader.